Fewer illegal immigrants came to the U.S. every year between 2007 and 2009 than in the years in the first half of the decade, the study found. 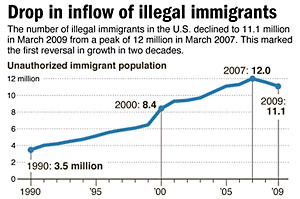 About 300,000 illegal immigrants entered the U.S. each year between 2007 and 2009, a drop from the 850,000 new unauthorized immigrants that entered each year between 2000 and 2005. Is this because of stricter immigration enforcement or because of tough economic times? Probably both. But if 600,000 immigrants have entered the U.S. illegally in the past two years while the total population of illegal immigrants has fallen by 900,000, that means about 1.5 million of them have returned to their home countries. There’s no way that enforcement has ramped up that much. This seems like it’s almost certainly primarily a reflection of the bad economy.